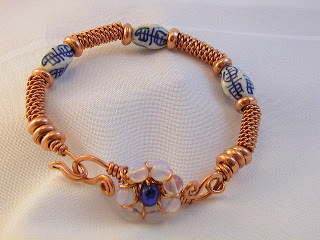 Three older vintage porcelain beads with hand formed copper coil tube beads and copper donut beads. The S clasp has a large dyed (but still gorgeous!) freshwater pearl and simulated "moonstone" glass beads. I textured the s arms on the clasp to a light hammered effect though this doesn't show up well in the picture.. the "moonstone" beads are just so pretty in good light. Copper is very malleable and this bracelet can be gently formed fitted to the wrist.